A host of St. Edward players drive back Olentangy Liberty’s Dylan Stevens (22) during the first half of Friday’s Division I state semifinal in Mansfield. 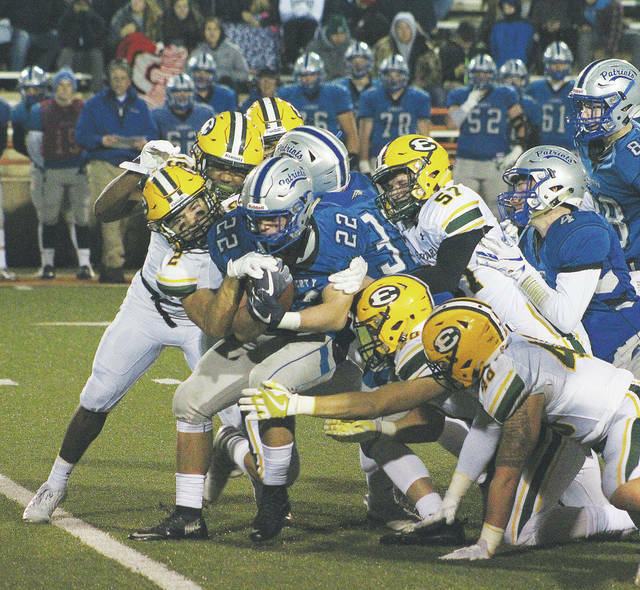 MANSFIELD – The Olentangy Liberty football team won its two previous playoff games by forcing turnovers and not making any mistakes. But, in Friday’s Division I state semifinal at Arlin Field, three first-half turnovers led to three touchdowns and the Patriots couldn’t recover, falling 42-16 to Lakewood St. Edward. Junior defensive back Lawson Nash intercepted two passes and recovered two fumbles – returning one for a touchdown to lead the Eagles (10-3). Nash’s interceptions gave the St. Edward offense 18- and 15-yard scoring drives, respectively. Jordan Castleberry capped each with a 4-yard touchdown run. Nash intercepted quarterback Mitchell Okuley on Liberty’s second play from scrimmage. Castleberry scored with 9:21 left in the first and the Eagles never trailed. Garrett Dzuro went 10-for-12 for 138 yards through the air and added 100 yards on 16 carries on the ground with a passing touchdown and a rushing touchdown. Castleberry ran it 19 times for 52 yards to go with his scores. Okuley found Chase Miley wide open down the field on a 45-yard pass play on Liberty’s first possession of the second quarter. Okuley made it count, going 11 yards around the left end for a touchdown and Liberty trailed 7-6 with 10:48 left in the half. Teon Smith punched the ball out of Okuley’s hand and into Nash’s hands later in the frame. Nash took the gift and returned it 53 yards to give the Eagles a 14-6 lead with 7:54 remaining. Liberty’s fortune continued as receiver Jake Sincek lost his footing on an Okuley deep ball, giving Nash plenty of room for his second pick. He returned it 27 yards to Liberty’s 15 to set up Castleberry’s second scoring run. Liberty got a 21-yard Mitchell Kershner field goal with 6 seconds left before the half to make it 21-9 at the break. The Eagles took some chances in the second half, converting three fourth-down plays on the way to their two third-quarter touchdowns. Dzuro scored on a 23-yard run early in the frame and found Quintel Kent on a deep ball over the middle for a 48-yard score a play after converting his third fourth-down play. Okuley added a 2-yard touchdown run early in the fourth. But Joseph Formani scored on a 2-yard run to help St. Edward hold its margin of victory. Okuley went 23-for-40 for 247 yards to go with a team-high 59 yards rushing on 15 carries. Miley and Kershner each caught five balls for 74 and 60 yards, respectively, to lead the way for the Patriots (9-5). Next up, St. Edward plays Cincinnati Colerain for a state championship at Tom Benson Hall of Fame Stadium in Canton at a date and time to be announced.